One of the piano pieces I chose for my Grade VIII examination many years ago was ‘From the Diary of a Fly’, found in Book 6 of Béla Bartók’s Mikrokosmos. An exciting work, I was both fascinated and intrigued by the its precision, with every detail inscribed into the score, even the stipulation of the total duration of the piece – 1 minute 35 seconds. I can’t recall whether or not I achieved Bartók’s timing. The author David Cooper, in this newly published biography, cites Malcolm Gillies’ 1989 publication Bartók in Britain. In this he remarks upon the reaction of the audience to a concert of the composer’s music that took place in the Aeolian Hall, New Bond Street, London in the 1920s. Whilst the opinion was, on the whole, positive, many found his music ‘over academic’. Cooper goes on to say ‘.....such allegations of musical academicism and a mathematical approach to composition would dog him for the rest of his life’. David Cooper is Professor of Music and Technology, and Dean of the Faculty of Performance, Visual Arts and Communications, University of Leeds. Specializing in the music of Bartók, he has already written a useful analytical publication: Béla Bartók: Concerto for Orchestra (Cambridge Music Handbooks), and other articles on the composer and his work. In this recently published, well-researched and definitive biography, Cooper discusses the life and career of this enigmatic man and musician, set against the historical and cultural background of the late nineteenth century and the first half of the twentieth century - a turbulent period riven by two world wars. 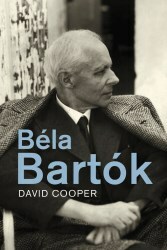 Cooper incorporates chronologically, within the biographical narrative, detailed analyses of Bartók’s music, discussing form, harmony and structure. For those who read music, useful examples are given. Throughout his life, Bartók (1881-1945) suffered more than his fair share of illness. Cooper chronicles these, from the earliest childhood afflictions that beset him. Eczema and bronchitis made him a reticent child, and maybe this accounts for the fact that he was a slow developer, at least as far as his walking and talking skills were concerned. At the age of nine he contracted pneumonia of the right lung, and began coughing up blood. His doctor advised that he spend several months in ‘a climatic resort of the south ... considering his delicate, tender and oversensitive character’. His mother accompanied him, as nurse, and maybe this helped forge the strong bond that existed between them until her death in 1939. When war broke out in 1914, he was rejected for military service on health grounds. Various illnesses were to plague him during the course of his life, and by 1942 he was starting to display the symptoms of leukaemia, his final illness, which was to result in his death three years later in 1945, at the age of sixty-four. Then there’s a string of infatuations and love affairs, culminating in two marriages; he was a man unlucky in love. In 1907, when he was twenty-six, he fell in love with the eighteen year old violinist Stefi Geyer. He composed a violin concerto for her, not published until after his death. The affair lasted less than two years. 1909 saw Bartók’s marriage to one of his young piano students Márta Ziegler, who bore him a son a year later named Béla after his father. Not a happy marriage, it ended in divorce fourteen years later. In 1915 , while in Slovakia studying folk songs, he fell under the spell of a fourteen-year-old named Klára Gombossy. He set a few of her poems. Again the liaison was short-lived. Later, another violinist came on the scene, Jelly d’Aranyi, but she rejected his amorous advances. Bartók married Ditta Pásztory, again a piano pupil, in 1923 with whom he had a son, Peter, the following July. There was, once more, a big age gap, he being forty-two, she nineteen. Cooper elucidates at great length Bartók’s work in the field of ethnomusicology. Together with his compatriot Zoltán Kodály (1882-1967), he began travelling around the countryside collecting and recording native folk music, and notating it. Some of this he incorporated into his compositions. The subject of whether Bartók suffered from Asperger’s Syndrome, a form of autism, remains an open question, with Cooper himself admitting that he is ‘not competent to make a clinical judgement ...’. There were obviously some contradictory traits in the composer’s personality, which the author lists: ‘cold, remote, lacking emotional intelligence. Mathematical, detached....’, yet he could be ‘warm, friendly, passionate, good-humoured, caring and engaged’. However, what comes out here is that he was a man of great integrity and honesty. Useful is a chronological list of works at the end of the book. Cooper also offers a comprehensive bibliography for those wishing to explore further. It is worthwhile mentioning two minor caveats. I find endnotes burdensome, and favour the convenience of page by page footnotes. Secondly, it will be a disappointment to many that no photos or pictures have been included. Nevertheless, this is a stimulating read, not only providing a detailed analysis of the Bartók oeuvre, but shedding light on a complex and misunderstood man and musician. Overall, this book stands as a valuable and useful resource.